By Keith Cowing on December 30, 2005 9:17 PM.
" On Friday, December 30, 2005, the President signed into law: ... S. 1281, the "National Aeronautics and Space Administration Authorization Act of 2005," which authorizes appropriations for the National Aeronautics and Space Administration for FYs 2007 and 2008; provides authorities to achieve the President's Vision for Space Exploration; and amends numerous NASA authorities, including those related to the Space Shuttle and the International Space Station." By Keith Cowing on December 29, 2005 12:42 PM. Editor's note: Just go to this auction on eBay and get your own personalized genuine fake Astronaut Diploma - complete with NASA seal and logo. Hmm. This seems to be on the verge of assisting in the impersonation of a federal employee. By Keith Cowing on December 29, 2005 11:04 AM. "NASA is honoring 38 men and women who risked their lives during Hurricane Katrina to protect the agency's Michoud Assembly Facility, where space shuttle external fuel tanks are manufactured east of New Orleans. The event is at 2 p.m. EST, Thursday, Jan. 5." By Keith Cowing on December 27, 2005 10:55 PM. "To determine the best exploration architecture and strategy to implement these many changes, the Exploration Systems Architecture Study (ESAS) team was established at NASA Headquarters (HQ) as discussed below." "One of the key requirements to enable a successful human space exploration program is the development and implementation of a vehicle capable of transporting and housing crew on LEO, lunar, and Mars missions." Editor's note: 793 pages to wade through - all quite interesting. More to follow -- after Christmas. At first glance, you can tell that they really put a lot of thought into this report - the schematics (below) of a lunar outpost build-up plan and the LSAM trade studies are good examples. Of course as the budget "sand" chart (below) shows, this is not going to be cheap. Continue reading ESAS Final Report - First Installment. By Keith Cowing on December 23, 2005 2:03 AM. Editor's note: I am not going to even touch NASA Watch until next week - maybe Tuesday - unless an asteroid hits - so please don't visit after today. By all means, eat too much food, play in the snow, and sleep late. Far too many of you visited over Thanksgiving. Take a break - I am. By Keith Cowing on December 22, 2005 4:04 PM. Editor's note: In September, after the announcement of the ESAS architecture results, NASA was telling people that it would release the actual ESAS report in a few weeks. This document was suposed to be hundreds of pages in length. Several months have passed. Where's the report? NASA has told OMB what money it needs iin FY 2007 - and why it needs that money. OMB has now responded via the FY 2007 budget passback. Wouldn't you think that the ESAS report would be needed to guide the budget formulation process? Editor's update: Word has it that a CD version of this report was distributed - but was then recalled due to errors. By Keith Cowing on December 22, 2005 3:10 PM. Posted on NASA Watch at the request of the NASA Federal Credit Union: "Today, NASA Federal Credit Union discovered an e-mail fraud attempt, known as "Phishing," that appeared to be from NASA Federal Credit Union. This e-mail was sent to the general public and to some credit union members. It instructed the recipient to click on a link to verify credit union information." Continue reading NASA Federal Credit Union Alert. By Keith Cowing on December 22, 2005 12:44 PM. "The Senate tonight passed the National Aeronautics and Space Administration Act of 2005, legislation authored by Senator Kay Bailey Hutchison (R-TX), Chairman of the Senate Commerce Subcommittee on Science and Space. The legislation authorizes NASA for Fiscal Years 2007 and 2008, establishes a policy objective of uninterrupted U.S. spaceflight capability and requires completion of the International Space Station (ISS).It has been reconciled with the House version and will now be sent to President Bush to be signed into law." By Keith Cowing on December 21, 2005 6:47 PM. "This notice is being issued as Request for Proposal (RFP) for Venture Capitalist Consulting Services. The contractor shall provide consulting as a Venture Capitalist for the Commercial Orbital Transportation Services (COTS) Demonstrations Team." Editor's note: This is a little confusing. Who's capital is being ventured? NASA's? The venture capitalist's? One would assume it is NASA's money. But is the term being used all that appropriate for what NASA wants to do since "venture capitalists" seek to "venture capital". Indeed, should NASA be acting like a venture capitalist at all? Continue reading NASA Wants a Venture Capitalist. By Keith Cowing on December 21, 2005 5:26 PM. Editor's note: The NASA Reauthorization bill may make its way to the Senate tonight. Stay tuned. Where Will The Rest of NASA's Katrina Money Come From? By Keith Cowing on December 21, 2005 5:20 PM. "The defense bill also includes funding for Hurricane Katrina reconstruction, the potential bird flu pandemic and a program that helps poor families pay winter heating bills." "The fate of the legislation is uncertain in the Senate, however, because of opposition from many senators to unrelated provisions of the bill." "NASA - $350 million is provided, $25 million above the request, to repair and rehabilitate damaged NASA facilities and equipment." "CHAIRMAN BOEHLERT: Let me ask you this. The White House has asked for $325 million for NASA to help pay for the Katrina-related costs at Stennis and Michoud. That's not nearly enough. That is about half of what you really need. Where is the additional money going to come from? ADMINISTRATOR GRIFFIN: As you know, in our last operating plan, we had requested $760 million, which was our best assessment of the damage that we had." Continue reading Where Will The Rest of NASA's Katrina Money Come From?. By Keith Cowing on December 21, 2005 12:11 PM. "It pays to be a rocket scientist. NASA gave the highest bonuses on average, with a typical award of $17,483." Continue reading Its Sure Nice to Be Senior Management at NASA. By Keith Cowing on December 21, 2005 9:02 AM. "Cowing said although the spending bill would keep NASA from laying off people next year, it does very little to eliminate layoffs at some point. "The language doesn't say NASA can't plan for a RIF over the next year. Planning for a RIF is a long process," said Cowing, who runs the NASAWatch.com Web site. "You can't just flip a switch and call for a RIF the next week." "(4) LIMITATION.NASA may not implement any Reduction in Force or other involuntary separations (except for cause) prior to March 16, 2007." By Keith Cowing on December 20, 2005 6:22 PM. "In the area of Human Systems Research and Technology (HSRT), whose budget funds your project, only that research and technology development absolutely required. The research and technology capabilities required for longer duration stays on the moon and Mars must be deferred, and NASA has assessed the HSRT protfolio identifying those capabilities that can be deferred to accommodate a reduced HSRT budget." Curiously, just as NASA HQ sends out these cancellation letters - with this rationale that "The research and technology capabilities required for longer duration stays on the moon and Mars must be deferred" - NASA JSC issued this press release today "NASA Seeks Volunteers for Spaceflight Simulation Studies" which explictly describes NEW studies of the very sort of research NASA Headquarters says it will no longer be funding: "NASA's Johnson Space Center in Houston is recruiting volunteers to participate in spaceflight simulation studies to help prepare the agency to send astronauts back to the moon and on to Mars and beyond. These studies will use long-term bed rest to simulate the effects of weightlessness on the human body." An image of one of these cancellation letters - edited to remove identifiers - appears below. Either NASA HQ and JSC are not communicating effectively (it happens) or NASA has decided to apply two totally different sets of criteria for the selection of internal and external space life science research. Continue reading NASA's Hypocritical Christmas Present for Life Science Researchers. By Keith Cowing on December 19, 2005 10:01 PM. 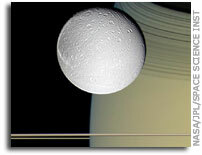 Original image: "Speeding toward pale, icy Dione, Cassini's view is enriched by the tranquil gold and blue hues of Saturn in the distance. The horizontal stripes near the bottom of the image are Saturn's rings." By Keith Cowing on December 19, 2005 10:00 PM. "NASA Administrator Griffin has been dramatically cutting basic life and microgravity science research across the agency. International Space Station (ISS) science has been devastated. These cuts have become quite a cause of concern in Congress. When asked what the criteria are for such cuts, only vague answers come back from NASA. With the NASA Authorization Act of 2005, Congress has put its foot down." By Keith Cowing on December 19, 2005 8:39 PM. "NASA Glenn Research Center wouldnt be able to lay off any civil servants until March 2007 under a bill passed by the House of Representatives late Saturday, but the center isnt yet in the clear. ... The bill does not prevent NASA Glenn from laying off some of its more than 1,000 contractors." By Keith Cowing on December 19, 2005 8:38 PM. "And if the probe had landed only one metre to the north, they say it would have survived and would be functioning today." "The scientist behind the British Beagle 2 mission to the Red Planet says the craft may have been found in pictures of the Martian surface. Colin Pillinger says the images suggest the mission very nearly worked, but Beagle somehow failed to contact Earth." ... "Professor Pillinger accepts the sceptics will say Beagle 2 is too small to be seen from space"
By Keith Cowing on December 19, 2005 7:33 PM. "NASA/HQ has a requirement for The Human Element hands-on, 6-day workshops focused on the hidden interpersonal dynamics that influence organizational and team effectiveness.This requirement will provide five (5) courses to NASA employees throughout the agency." Subject: Synopsis "The Human Element 6-day Training Workshops", The subject Synopsis, reference number 4200137435 is hereby canceled in its entirety. Editor's note: Gee, that was fast. Continue reading Another Surge of Training. By Keith Cowing on December 19, 2005 5:30 PM. "The pending Boeing/Lockheed "United Launch Alliance" (ULA) to provide the Air Force with expendable rockets would unfairly strand taxpayers with a half-billion-dollar-a-year subsidy: that's the message the 350,000-member National Taxpayers Union (NTU) delivered to Congress today, in an open letter urging lawmakers to end subsidies for the companies' current and proposed space-booster schemes. Federal policymakers are expected to consider the merger deal as early as this week." By Keith Cowing on December 19, 2005 2:23 PM. Editor's note: 2:25 pm EST A structural issue in the first stage fuel tank has arisen and the launch is off until at least next month. Editor's note: 2:00 pm EST Launch window has opened - still in a 15 minute hold due to weather. When countdown resumes there are 15 minutes of additional procedures remaining - pulling back the strong back, vehicle self alignment and check, etc. Editor's note: 1:52 pm EST 5 minutes into a 15 minute hold. Winds at 27 knots. Close to full on fuel. "On Monday, December 19 at 11 a.m. PST (7 p.m. GMT), the Falcon 1 rocket will begin its journey to orbit, accelerating to 17,000 mph (25 times the speed of sound) in less than ten minutes." "I asked Boeing why they're not working on this and they said, 'If it succeeds, we'll just buy them,' " the source said. "California-based Boeing spokesman Dan Beck said SpaceX's planned launch will not affect Boeing. "We wish them the best as they try to enter this difficult market," Beck said." By Keith Cowing on December 19, 2005 9:50 AM. "At a news conference today at NASA/Ames Research Center in Mountain View, U.S. Rep. Mike Honda, D-Campbell, and other civic leaders will unveil a number of proposals aimed at nurturing nanotechnology in California." By Keith Cowing on December 19, 2005 9:48 AM. "ATK won the contract this month for the basic launcher, but Horowitz dismisses suggestions that his appointment carries a conflict of interest: "I've been promoting this philosophy for years," he said. "I designed the rocket while I was still at NASA." By Keith Cowing on December 17, 2005 7:36 PM. "Today, the House approved the Conference Report for S. 1281, the National Aeronautics and Space Administration (NASA) Authorization Act by a unanimous voice vote." Editor's update: The House began discussion at 5:41 pm EST. They then adopted the Conference Report at 6:25 pm EST. Editor's revised note: Sen. Jim Talent (R-MO) put a hold on the NASA Authorization Conference bill Friday afternoon because he feels that NASA is not spending funds on X-43C as it had previously agreed to do in FY 2005. This was an issue raised by Sen. Talent during the FY 2006 NASA appropriations conference effort earlier this year - and he is using his hold on this authorization bill as an opportunity to reiterate that concern. In reality, the hold Talent has dropped on this authorization bill actually has nothing at all to do with the intent or function of this bill. Rather, Talent is using this approach to try and force NASA to fund the X-43C with $17 million of the $25 million provided in the Appropriations bill. This authorization bill does not call out spending on the X-43C. Rather, it does address funding for "hypersonic research". Since X-43C is not specifically called out, and the Appropriations bill spelled out its direction as to how funds should be allocated, NASA's interpretation has been that it now has direction as to how it should spend its hypersonic research funds - and it has proceeded to do so. Talent's effort may cause a delay in obtaining unanimous consent in the Senate and, according to Senate sources there are other means to deal with this bill. If need be, the Senate will take up the matter after the holidays- and pass it, as written - and agreed to by the House. Continue reading NASA Authorization Act Conference Report Update. By Keith Cowing on December 17, 2005 6:11 PM. By Keith Cowing on December 17, 2005 2:44 PM. "The contestants believed they were Britain's first 'space tourists' Three contestants have spoken of their disbelief after being fooled into thinking they went into space for the UK reality show Space Cadets." ..."Aw man, we're not astronauts. We're just asses." By Keith Cowing on December 16, 2005 12:07 PM. Editor's note: The PRCB (Program Requirements Control Board) met yesterday, 15 December 2005. According to a source in attendance, from 9:00 am to 1:30 pm the PRCB discussed the External Tank. The attendees took a break at 11:15 am. Wayne Hale said that after the break everyone would come back and "hit the schedule issue hard". The bottom line: the PAL ramps will be removed. Once the discussion was over Hale polled the attendees and there were no 'Nays'. Continue reading PRCB Update: Remove The PAL Ramps. By Keith Cowing on December 16, 2005 10:53 AM. "The purpose of todays briefing is to present the information provided in the COTS-01-05 Draft Announcement released on December 5, 2005." By Keith Cowing on December 15, 2005 1:05 PM. Editor's note: A last minute NASA shuttle news telecon was just announced with Associate Administrator for Space Operations Bill Gerstenmaier from JSC. Audio of the teleconference will be carried live today at www.nasa.gov/newsaudio. The event starts at 3pm EST. By Keith Cowing on December 15, 2005 12:02 PM. "Last year, this same issue was a hard-fought priority and veto fight on your part. NASA now has clear support in Congress and in 2006, regardless of OMB's actions, the House and Senate are prepared to fight for the Vision. However, OMB's plan will fly in the face of both House and Senate versions of pending NASA Authorization legislation currently in conference, which will fully fund the Shuttle and the entire Exploration Vision. OMB is on a course to take defeat from the jaws of victory by completely contradicting your own stated priorities and what will almost certainly become the law of the land in the authorization bill." By Keith Cowing on December 15, 2005 12:00 PM. Editor's note: 50 minutes just to say "Merry Christmas"? Or are they going to do the whole Happy Hanukkah, Kwanza, Winter Solstice, etc. roll call - in English and Russian? Editor's note: I stand corrected - by JSC - but still, 20 minutes to say "Merry Christmas"? I once did a lengthy interview with an ISS crew on-orbit in the same (actually 25 minute) window -- "Your posting on the Christmas greeting downlink is incorrect. The PAO prep is time to setup the camera(s), voice comm checks etc. The downlink itself, which is not just the Christmas greeting, is only 20 minutes (1515-1535).The EPO procedure review (1535-1555) is totally unrelated, EPO standing for Education Payload Operations, a series of activities performed by many crewmembers over the years to explain various aspects of space flight and living on ISS." Continue reading Christmas Greetings From Space. By Keith Cowing on December 15, 2005 10:44 AM. Editor's note: Word has it that Mike Griffin intends to replace ARC center director Scott Hubbard with Brig. Gen. Simon P. Worden (Ret.). Apparently, Hubbard has gotten folks at HQ annoyed by his constant defense of his workforce while HQ slashes away at life sciences (and other programs) and threatens RIFs. Pete Worden (an astronomer) is a friend of Griffin's and has a reputation in many circles for innovative (and sometimes a little controversial and out of the box) thinking. He recently did a stint on the staff of Sen. Sam Brownback and ran the Clementine lunar mission and the DC-X Delta Clipper project. Note to Ames folks: he is not boring. Personally, I find him fascinating. Expect a formal announcement soon. By Keith Cowing on December 14, 2005 7:26 PM. Editor's note: Word has it that Mike Griffin and his entourage left JSC last night to fly back to Washington, DC. He did this so he could meet with White House staff on NASA's reclama to the FY 2007 budget that NASA is apparently going to get.Griffin reportedly made a last minute pitch to get a 9% budget increase instead of the 4% OMB gave him last week when it sent the FY 2007 budget passback to NASA. Stay tuned. "FY 2006 16,456.3 - FY 2007 17,897.7 - Delta 8.8%"
By Keith Cowing on December 14, 2005 2:51 PM. Editor's note: It has been more than 2 weeks since the NASA Advisory Council met - and the presentations from that meeting are still not online. This is a notable departure from the previous norm in recent years where the NAC was very good about posting things online within days - sometimes hours - of a meeting. Who Wants to Conduct NASA's Upcoming RIF? By Keith Cowing on December 14, 2005 11:11 AM. Editor's note: If you look at this open job position on OPM's website you will see that NASA is seeking candiates for "Associate Administrator for Institutions and Management" i.e. Jim Jennings' old job. Hurry up - apply now! By Keith Cowing on December 14, 2005 10:48 AM. "The cost of a Northrop Grumman Corp. weather satellite program is expected to grow by 25 percent, triggering a congressionally mandated review of alternatives, a defense analyst and a source familiar with the program said on Tuesday. The Pentagon will formally notify Congress soon about the expected cost overrun in the National Polar-Orbiting Operational Environmental Satellite System (NPOESS), said defense analyst Loren Thompson of the Lexington Institute and the source, who asked not to be named." By Keith Cowing on December 14, 2005 10:36 AM. Editor's note: Those of you who are job hunting might want to look at the more than 100 SES jobs that are open at NESC until 20 June 2006. Reader comment: "One of the frustrating things is that many spots in the NESC are open only to GS-15/SES levels. Typically those with that grade have spent many years in service and likely moved into management positions, particularly since you aren't going to find many SES personnel who got their SES in a technical position. So what's the point? The longer you stay in management the more your technical skills erode in general. Seems like the real goal of NESC should be to fill slots with experienced GS-12/13/14s who still have their feet firmly planted in the technical side, not management. Shouldn't the NESC be made up of the sharpest technical minds rather than the sharpest bureaucratic minds?" By Keith Cowing on December 14, 2005 8:59 AM. "NASA administrator Michael Griffin has estimated the shortfall in shuttle operations at $3 billion to $5 billion through 2010, when launches are scheduled to stop. Congressional overseers believe it may be as high as $6 billion." By Keith Cowing on December 13, 2005 3:24 PM. Editor's note: Word has it that astronaut - and senior Griffin advisor - Marsha Ivins has more or less packed up her office and is ready to head back to JSC permanently (even though she has been commuting back and forth). Meanwhile, Chris Shank has moved over to the NASA HQ Office of Program Analysis and Evaluation where he is now Director of Strategic Investments. By Keith Cowing on December 13, 2005 10:40 AM. "Virgin Galactic, the British company created by entrepreneur Richard Branson to send tourists into space, and New Mexico announced an agreement Tuesday for the state to build a $225 million spaceport. Virgin Galactic also revealed that up to 38,000 people from 126 countries have paid a deposit for a seat on one of its manned commercial flights, including a core group of 100 "founders" who have paid the initial $200,000 cost of a flight upfront. Virgin Galactic is planning to begin flights in late 2008 or early 2009." "'Dallas' star Victoria Principal is set to be the first female tourist in space. The actress has reportedly splashed out 115,000 to be rocketed 70 miles above Earth when Sir Richard Branson launches commercial space flights in 2008." By Keith Cowing on December 12, 2005 11:43 PM. "Although Cleave is an ecologist by training, she has no oversight of NASA's biological and physical sciences. That portfolio belongs to Horowitz, who is drastically reducing funding for a host of experiments designed for the space station. He's already canceled at least half of NASA's current life sciences grants and contracts. Much of the research planned for the station has little connection with Bush's plan to return astronauts to the moon and continue to Mars, Horowitz told Science." "The panel saw no evidence of an integrated resource utilization plan for use of the ISS in support of the Exploration Missions. Presentations that covered some elements of criteria and processes for determining priorities for utilization of ISS for different exploration missions demonstrated poor definition of those criteria and processes." By Keith Cowing on December 12, 2005 11:41 AM. "NASA selected the mishap investigation board to determine why the Demonstration of Autonomous Rendezvous Technology (DART) spacecraft did not complete its mission on April 15." Editor's note: It has been more than 8 months. Why hasn't there been any word as to when the DART Mishap Investigation Board will issue its findings? Word has it that the results of the investigation have actually been known for some time. Editor's update: Word has it that as of last week, the DART mishap report (which does apparently exist) was undergoing a classification review by DoD - and DoD has not provided a date for the report's release. As such, the current delay seems to be of DoD's making - not NASA's. By Keith Cowing on December 11, 2005 8:36 PM. Editor's note: The email exchanges below occurred between Mike Griffin and his senior staff between 22/23 November 2005 in reaction to the release of the NRC Report: Review of NASA Plans for the International Space Station. About the report itself, Griffin says: "I've read the report, and there is not much good in it for us. Not surprising, however, coming from Len Fisk. I'm copying a bunch of folks on this note because it concerns the nucleus of a strategic problem for us in going forward with the VSE. Bottom line, we're going to have to answer the specific issues in this report." Continue reading What Mike Griffin *Really* Thinks About NRC's Space Station Report. By Keith Cowing on December 11, 2005 8:22 PM. "The head of the European Space Agency said on Friday he was confident he could win enough support from member states to help develop Russia's next-generation spaceship." "The European Space Agency has allocated 650 million euros for the coming three years for a development program for the International Space Station." By Keith Cowing on December 10, 2005 10:21 AM. "Speculating that there will be no job cuts at Marshall when other NASA centers could lose jobs could be wishful thinking, said Keith Cowing ... Cowing said the buyouts won't likely meet NASA's target number of 2,000 job reductions. "I will say it looks like the agency doesn't know what to do with Marshall yet. (Work) is still being sent to Marshall, but based on (recent) buyout numbers, the jobs math doesn't add up," Cowing said. "Mike Griffin has no choice but to" lay off workers." PRCB Update: Drifting Toward A Later STS-121 Launch? By Keith Cowing on December 9, 2005 4:33 PM. Editor's note: A PRCB Directive was signed yesterday (SEE FULL TEXT BELOW). According to those who have read it, the directive implies (but does not call for) a possible move of the launch of STS-121 (beyond May 2006 timeframe). The indication comes from the fact that the directive authorized moving forward on removing the PAL ramps. As has been discussed previously, the removal of the ramps would require testing to insure that the lines previously protected by the PAL ramp would survive lift off loads. That testing would probably not be completed in time to support the May 2006 launch. It is important to note, in all due fairness to NASA, that NASA has not actually set a specific date for the launch of STS-121. Rather, they have a window that they are aiming for. As such, it is not exactly correct to say that the launch may be slipped - rather that the target period may slip. Either way, there is a possibility that STS-121 may sit on Earth longer than had been hoped. Continue reading PRCB Update: Drifting Toward A Later STS-121 Launch?. By Keith Cowing on December 9, 2005 2:57 PM. "Three men employed at Goldstone Deep Space Communication Complex at Fort Irwin died Thursday in a crash on Fort Irwin Road about two miles north of Jackhammer Pass. Three other Barstow-area residents were seriously injured in the collision, and a driver who fled the scene is being sought by the California Highway Patrol." By Keith Cowing on December 9, 2005 2:54 PM. Editor's note:This letter was sent out by Doug Cooke at ESMD on 29 September 2005 with guidance to the NASA centers about RLEP2 roles. It is clear that there was no intent to give APL the Comm/Nav piece. Comm/Nav was explicitly called out as a GSFC role. By Keith Cowing on December 9, 2005 8:21 AM. Editor's note: Meetings have been underway at Michoud all week to discuss issues associated with foam application to Shuttle External Tanks. Also under discussion is the ability of the tanks to fly without application of foam in some areas. Stay tuned. By Keith Cowing on December 8, 2005 10:53 PM. "In a November 17th letter sent by Administrator Griffin to Office of Management & Budget (OMB) Director Joshua Bolton, Dr. Griffin states that, "the budget allocation provided to NASA is insufficient." By Keith Cowing on December 8, 2005 10:46 PM. "Two Months ago, I submitted the FY 2007 budget request for the National Aeronautics and Space Administration (NASA) that was over-guide for the Space Shuttle and Space Station programs. Since then, NASA has worked closely with your staff and others in the Executive Office of the President to address various policy and program options in order to keep NASA's overall budget within current budget guidelines while ensuring that the Agency address the goals and priorities set forth by the President's Vision for Space Exploration." By Keith Cowing on December 8, 2005 9:55 PM. Editor's note: NASA is expecting to get the 'passback' of its FY 2007 budget submission back from OMB any day now. Traditionally, NASA sends the budget over to OMB sooner - usually in October/early November - such that the 'passback' happens just before Thanksgiving. Traditionally, someone at NASA is pouring over budget charts while their turkey gets cold. This year things were delayed by a few weeks. All of this stuff is hush hush, ultra-secret, embargoed, etc. What follows is a preview of what NASA might expect - given what it asked for in FY 2006 - and now, for FY 2007. Update: The source of this information is one page within the handout version of charts shown by NASA CFO Gwen Sykes at last week's NAC meeting. Curiously, while the budget chart was in the hardcopy I picked up off of the table outside the meeting room, she never showed this one particular chart during her presentation. I wonder why. Continue reading NASA's FY 2007 Budget Submission to OMB. China as an ISS Partner? By Keith Cowing on December 8, 2005 6:38 AM. "The United States should strive to finish the half-built international space station and overcome financial obstacles by reaching out to China and other prospective partners, U.S. Sen. Kay Bailey Hutchison said here Wednesday." By Keith Cowing on December 7, 2005 10:25 PM. "Equating the loss rate of methane recently discovered in the Martian atmosphere to the production rate by possible methanogens, we estimate that a possible Martian habitat would be at a temperature of 0C and that the concentration, if uniformly distributed in a 10-m-thick layer, would be 1 cell per ml." Has The Air Force Forgotten About Competitive Procurement? By Keith Cowing on December 7, 2005 10:10 PM. "When the Air Force finds that it has painted itself into a corner, it sometimes comes up with an odd solution: It keeps on painting. That's how I see United Launch Alliance, a proposed Boeing-Lockheed Martin joint venture that industry sources expect the Pentagon and Federal Trade Commission to approve shortly. And that could be a mistake for the industry and for taxpayers." By Keith Cowing on December 7, 2005 6:02 PM. "I am aware that many in the science community have questioned NASA's commitment to science, and believe their own work to be gravely threatened by the Vision for Space Exploration. Let me speak directly to this point." Has NASA forgotten How to Do Competitive Procurement? By Keith Cowing on December 7, 2005 5:50 PM. "ATK is the only source for a large human-rated, reusable solid propellant motor. " Reader note: "What is even more interesting is this was released during Thanksgiving week, with a due date of Dec. 2. How is anyone supposed to do the research required for even a minimal response in 7 working days? Somehow this doesn't seem fair or realistic." "NASA/MSFC was assigned the project under an internal NASA competition based largely on concepts and expertise contributed by Johns Hopkins University/Applied Physics Lab (JHU/APL.) NASA/MSFC intends to purchase the items from JHU/APL pursuant to 10 U.S.C. 2304(c)(2), unusual and compelling urgency ... Only JHU/APL is in position to meet the required schedule based upon implementing their existing, unique, and innovative mission concept with an established project team including a world class lunar scientist." Editor's note: Well, DUH, if you base the spacecraft on a JHU/APL concept, of course they know the idea better than anyone else. Why not compete the concept to see if anyone can do it better? Why is this an "usual and compelling urgency" anyway? "NASA/MSFC intends to purchase the prototype LNCI system from Johns Hopkins University/Applied Research Laboratory (JHU/APL). JHU/APL's status as a University Affiliated Research Center (UARC) allows JHU/APL to function as an extension of a program or project office in providing, without an Organizational Conflict of Interest (OCI), oversight, risk reduction and problem solving capability in a manner that ensures the best interests of the government and contractors are protected." Editor's note: I don't get it. Mike Griffin constantly complains about the lack of engineering expertise resident within NASA - and seeks to get it back via "in sourcing" - and then he turns around decides to send all of this work to JHU/APL (his former employer) on a sole source basis. Editor's update: I asked MSFC Center Director Dave King about this today at lunch here at the NASA Risk meeting. Specifically, I asked him why the RLEP2 mission was not openly competed, and why, in a time when NASA wanted to bring expertise back in-house, MSFC wanted to send it to JHU/APL instead. At first, he replied that this project had been "internally competed" between MSFC and GSFC. A few moments later he re-characterized the selection of JHU/APL as having been "sort of competitively chosen." King did not respond to the issue of in-sourcing as it relates to RLEP2. By Keith Cowing on December 6, 2005 10:34 PM. "Throughout history, the great civilizations have always extended the frontiers of their times. Indeed, this is almost a tautology; we define as "great" only those civilizations which did explore and expand their frontiers, thereby ultimately influencing world culture. And when, inevitably, some societies retreated from the frontiers they had pioneered, their greatness subsided as well." By Keith Cowing on December 6, 2005 10:01 AM. Phase 1 A period of development and demonstration by private industry in coordination with NASA of various space transportation capabilities to and from low-Earth orbit (LEO) determined to be most desirable for the Government and other customers. Phase 2 A potential competitive procurement of orbital transportation services to resupply the ISS with cargo and crew, if a capability is successfully demonstrated and the Government determines it is in its best interest." By Keith Cowing on December 5, 2005 8:48 AM. "Ministers from 17 European countries are meeting in Berlin to discuss the future of Europe's space programme. They will decide whether to give the go-ahead to a series of space missions proposed for the next decade." By Keith Cowing on December 4, 2005 6:01 PM. "[Space Services Inc] says that early next year some of Cooper's remains, along with those of 173 other people from eight countries, will be launched on a SpaceX Falcon 1 rocket from Vandenberg Air Force Base in California. Some of the remains of the late James Doohan, who played Mr. Scott on "Star Trek," will also be on the flight." "Senior managers spent Friday discussing layoff plans with supervisors, Amatore said. "They will brief their staff either (Friday) or Monday about the planning stage to keep the work force informed of what is going on." By Keith Cowing on December 4, 2005 11:21 AM. Editor's note: The other day I posted this image wondering if it was showing one of those little troll dolls (you know with the wild spiky hair on top of their heads). Well, it seems I forgot that there is no 'up' or 'down' in outer space. Had I rotated the image I would have seen that it was a little hula girl. Now that this mystery has been solved, the question remains: what is she doing on board the ISS? Continue reading Hula Girl Sighted on ISS. By Keith Cowing on December 3, 2005 5:09 PM. Editor's note: Look at the extreme upper left hand corner of this image: "ISS012-E-08727 (16 November 2005) ISS crew work at the Simvol-Ts / TORU workstation in the Zvezda Service Module of the international space station during onboard training for relocation of the Soyuz TMA-7 spacecraft.". Mickey has been on orbit for a while. You can see him velcroed to the wall in this image - between the fire extinguisher and laptop - during expedition 11. By Keith Cowing on December 2, 2005 10:11 AM. "On November 26, 2005, the back-up solar array drive on Landsat 5 began exhibiting unusual behavior. The solar array drive maintains the proper pointing angle between the solar array and the sun. The rotation of the solar array drive became sporadic and the solar array was not able to provide the power needed to charge the batteries." By Keith Cowing on December 2, 2005 10:08 AM. "NASA has recently begun using the Senior Review process, developed for the space sciences, to make decisions on extensions for Earth science missions. Previously, these decisions had been made ad hoc. This report by the National Research Council's Committee on Extending the Effective Lifetimes of Earth Observing Research Missions reviews the current process and provides recommendations for adapting this process to the specific needs of NASA's Earth science missions." By Keith Cowing on December 2, 2005 9:27 AM. Editor's note: Yesterday's 1 December 2005 PRCB (Program Requirements Control Board) was rather routine. At one point, Wayne Hale returned late from a break in the proceedings and apologized, explaining, "I was stopped in the hall by PAO. Someone kindly forwarded one of my emails to the Washington Post [article] and I have to talk to them today. I don't mind but this is kind of a busy day." Continue reading PRCB Update: Looking Ahead to Future Natural Disasters. By Keith Cowing on December 2, 2005 9:25 AM. "We don't give direction by e-mail," Hale said. "We will have a formal board meeting to review this." The e-mail, he added, "is not a decision, but a notice to my folks that tells them 'this is the way I'm thinking; this is the way I'm leaning. Talk me into it, or talk me out of it.' "
By Keith Cowing on December 1, 2005 8:05 PM. Continue reading Yank Their Job - Then Throw Them Crumbs. By Keith Cowing on December 1, 2005 8:00 PM. Reader note: "I am a Jacobs Sverdrop employee and I work on site at NASA JSC. We received this "first notice" from our management. We are expecting a loss of at least 200 employees and as many as 500." Continue reading JSC Contractor Layoffs Ahead?. By Keith Cowing on December 1, 2005 5:59 AM. "We can hope that VSE will come to represent the triumph of hope over experience. But will the basic and applied science be done beforehand that is necessary to keep the explorers safe and healthy, or will these professionals seem more like participants in another extreme sport? There are promises that some of these programs will be restarted after the Moon piece of VSE is done, but then the scientists will be someplace else, and NASA will need years to grow some more seed corn. Griffin should consider some fixes: First, restore NASA's Advisory Council to its full membership; second, ask it to conduct a thorough study of which life sciences efforts are essential to the new vision; and finally, rescue the life scientists and bring them back to the science office." Editor's note: A hard copy of this editorial was handed out to all of the members of the NASA Advisory Council at the beginning of Wednesday's meeting.